The Cal-Bridge program is a partnership between community colleges, California State Universities (CSUs) and Universities of California (UCs) in southern California, with the goal of supporting students in completing their Bachelor’s degrees and entering into PhD programs in astronomy and related fields. The program supports students financially so they can focus on their studies, and through training programs and mentoring by teams of CSU and UC faculty. Cal-Bridge is co-directed by Prof. Alex Rudolph at Cal Poly Pomona and Prof. Tammy Smecker-Hane at UC Irvine, and supported by the NSF S-STEM program. A slide from Adam’s presentation, giving some motivation for graduate school (getting rich is not one of them). Why is graduate school a good option for some students? People with graduate degrees have more career options, better pay (although it’s hard to be a millionaire with a Physics degree) and more job satisfaction, although it does require committing to up to 7 years of additional study and research. How do I prepare for graduate study? It starts with doing well in classes, particularly upper division math and physics; getting research experience (e.g., through NSF REU or other summer/academic year research programs); and getting to know your professors. How do I choose a graduate program? Some key factors to weigh are the size of the program, the faculty and research programs available at the institute, the culture and reputation of the department, and geographic and family considerations. Most important – can you imagine living here for the next 5-7 years? How do I apply for graduate school? The most important thing is to get organized early. Research what schools you might be interested in, and ask advisors/mentors/senior students for advice on the best programs. Be sure to know your deadlines, particularly deadlines for fellowships and fee waivers, and communicate with your potential letter writers well in advance of deadlines. Make sure to plan on taking the GRE and Physics GRE (many programs require both) early in the fall of your Junior year (you can attend Physics GRE bootcamps in August in California). And if you don’t get in on the first go, there are still options through Master’s programs or participation in the APS Bridge Program if you’re an under-represented minority. What are the finances associated with graduate school? One often overlooked benefit of being an astronomy/physics student is that nearly all PhD programs, and many Master’s programs, have tuition paid in full by the Department, and you even draw a salary (small – of order $15,000-$20,000/year) for being a teaching or research assistant. However, there are still costs associated with housing, travel and family responsibilities to consider. Graduate fellowships also widely available, which can cover several years or even the entirety of the graduate program period. The NSF Graduate Research Fellowship is one of the biggest (and hardest to win), but there are also UC fellowships that support students from under-represented groups or who have overcome significant adversity, that can pay tuition and salary for up to 4 years. What does graduate school entail? Adam went over a typical timeline: classes and qualifying exam in year 1, transition to research and finding an advisor in year 2, designing a thesis project and going up for candidacy in year 3, and research/writing/publishing/presenting until the last year when you defend your thesis (right after applying for post-graduate jobs!). How can I improve my chances of succeeding in graduate school? Focusing on your health and work-life balance is important – a graduate program, particularly a PhD, is a marathon, not a sprint. It’s also critical to set up a network of mentors (not just your advisor), and to get involved in graduate life at the departmental or university level. What’s after graduate school? Post-graduate positions in astrophysics are about evenly split between temporary postdoctoral positions and possibly permanent positions in academia, government and industry. Astronomers go on to many different kinds of careers, from astronomy to finance to software engineering, and at many kinds of institutions. Employers are interested in the kind of quantitative analysis skills that come from pursuing an astrophysics graduate degree! Participants listening in on the Graduate Admissions panel. After the presentation, there were two panel discussions. The first had faculty and staff involved in graduate admissions at UC San Diego: Prof. Quinn Konopacky and Prof. Tom Murphy in Physics, both of whom have served on UCSD’s graduate admissions committee; and Chris Murphy from the UCSD Graduate Division. The faculty gave advice on what skill sets are needed for graduate school, and how to identify the right programs and advisors. Chris let folks know about the many fellowship opportunities available at UCSD and the UC program at large, particularly for students from traditionally under-represented groups. Graduate Student panel, from left to right: Jessica Maldonado, Katy Rodriguez Wimberly, Caleb Choban, Daniella Bardalez Gagliuffi and Chris Theissen. 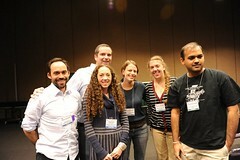 The second panel was all graduate students, and the Cool Star group featured prominently. The two “veteran” graduate students on the panel were Daniella Bardalez Gagliuffi and Chris Theissen; while the three “incoming” graduate students were Caleb Choban, Jessica Maldonado (Cal Poly Pomona->Michigan State University) and Katy Rodriguez Wimberly (CSU Long Beach->UC Irvine with an NSF Graduate Fellowship). Here, there was more discussion about graduate life, how to choose and work with advisors, and how to narrow down the research topic. This was the most popular part of the program. Prof. Shelley Wright discusses the instrumentation and research that takes place in the CASS Optical Infrared Lab. Finally, we had a short amount of time (not enough!) for tours of the astrophysics labs at UC San Diego. Adam and Daniella gave brief tours of our remote observing stations (not very effective since it was the middle of the day); UCSD graduate student Lindsay Lowry showed off the hardware in the UCSD Cosmology lab, which in the process of constructing new telescopes and instrumentation to study the Cosmic Microwave Background; and Prof. Shelley Wright showed off her lab, the CASS Optical Infrared Lab, which specializes in instrumentation for the Thirty Meter Telescope and in the Search for Extraterrestrial Intelligence (NIR-SETI).